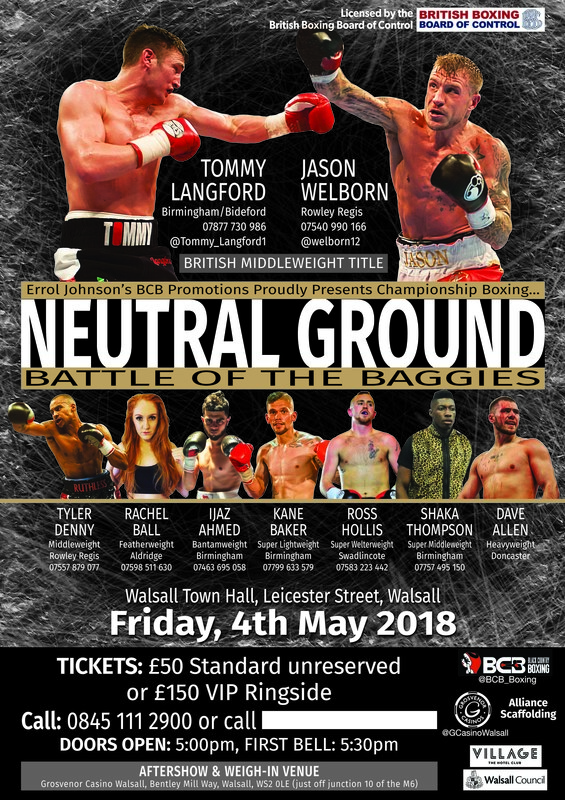 Fresh from a win at Villa Park in March Shaka Thompson (3-0 0KO’s) faces a quick turnaround as he looks ahead to featuring on BCB Promotions’ ‘Neutral Ground’ show at Walsall Town Hall on Friday, 4th May. “I train out of the Hall Green boxing club, and I am being coached by Tom Chaney, every day I step in the gym I’m learning and perfecting my craft. Thompson trains at the same gym as British champion Tommy Langford and is confident his stable mate will get the job done in the huge British title clash that headlines the show. Despite his obvious interest in the main event Thompson is confident his fans will make plenty of noise on the night as he looks to make a statement. Tickets, for Langford versus Welborn, priced at £50 standard unreserved and £150 VIP Ringside, are on sale now from the Walsall Town Hall Box Office 0845 111 2900. The undercard features Denny, Doncaster Heavyweight and two-time Commonwealth Title Challenger, Dave Allen, Walsall featherweight, Rachel Ball, Swadlincote super welterweight, Ross Hollis, and Birmingham super lightweight Kane Baker.